Summer Camps - Exceptional Equestrians of the Missouri Valley, Inc. Exceptional Equestrians is excited to offer another exciting summer of our highly-acclaimed horsemanship day-camps! Our summer programs offer a variety of activities and learning experiences for children of all ages. Located at our beautiful farm outside of Washington, MO, these camps will leave your children with memories to treasure! All of our camps give kids and teens the opportunity to experience and explore life from a different perspective. Campers will learn about responsibility, teamwork, respect and compassion. All of our instructors have extensive experience riding and successfully competing and working in various disciplines. They hold certifications with PATH Intl. as well as American Red Cross CPR and First Aid. Mark your calendars for 2019 Summer Camps, beginning on June 3rd, 2019! Saddle Up Camp is ideal for a children who have limited experience. Ground-up horsemanship is taught emphasizing safety and fun. Learn basic horsemanship, including grooming, tacking and caring for horses. Basic equitation skills to foster conscientious, balanced and safe equestrians. Including: steering, stopping and riding independently. 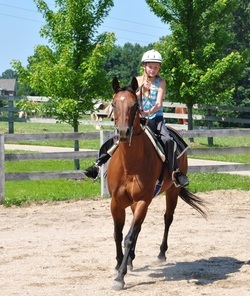 Giddy Up camp is geared towards experienced riders who are able to ride independently at the walk and trot. Increased equitation skills for disciplines in jumping, dressage and western riding. Equine-oriented careers and resources for development of life-long equestrians. Call (636) 390-2141 or email at info@eemv.org.